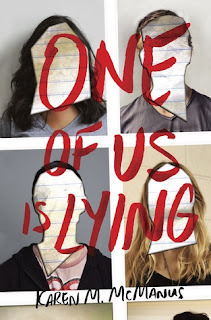 Blurb Description: One of Us Is Lying is the story of what happens when five strangers walk into detention and only four walk out alive. Everyone is a suspect, and everyone has something to hide. Mystery isn’t my favourite YA genre (I’m a fantasy girl all the way) but occasionally I like to sink my claws into a story that will leave me at the edge of my seat with the WHO-DUNNIT element. And that’s the sole reason why while One Of Us Is Lying was a GOOD book, it didn’t make me suspect the four teenagers in the room – NOT ONCE – making it seem slightly off. That vital blame game was missing and while I was curious to see who did it, I NEVER FELT THAT INTENSE NEED TO KNOW. 1. THE PLOT OF THE BOOK WAS REALLY INTERESTING, and that’s the reason I requested it! Five teenagers locked in detention, a car crash to send the teacher out and the boy with a gossip website and a horrifying secret about everyone in that room dies from an allergic reaction. GREAT PLOT. 2. I also loved that the book was told from the viewpoints of all four potential murderers. It made you get to know them a lot more and piece together stories of the story. 3. While I liked the above point (^), it was also the reason the book didn’t have the who-dunnit element. NONE OF THE CHARACTERS HATED SIMON ENOUGH TO KILL HIM, and I fully believed that they didn’t making me uninterested in finding out which of them killed him. Honestly, I LIKED the characters too much to see them as murderers. 4. One of my favourite characters was Addison. I adored her character development in the book. She took huge steps to from a girl that made every decision based on her boyfriend’s whims and fancies to one who one who cut her hair and turned badass. I loved her spirit and I really liked how much she changed. 5. Honestly, I liked the book. The characters were well developed, the plot was definitely unique but I didn’t SUSPECT ANYONE. It didn’t make me blame anyone and I just accepted the ending as it came. What are some of your favourite YA mysteries? What is your favourite YA subgenre? Have you read One of Us Is Lying? What did you think of it?